Asana also means a throne or a pedestal. If the pedestal of lotus is arranged in single petal row it is called Padmasana. If the lotus petals are arranged in a double row it is called Viswapadmasana. The pedestal supported by lion is called Sinhasana. The pedestal supported by the tortoise is called Kurmasana. It is a sleeping pose of Hindu God Vishnu. A pose of dancing Shiva and other various tantric Gods are found in this position. The Meditative pose is also called padmasana. In this position the legs are crossed closely locked with the soles of both feet visible. All Buddhas and Bodhisat was seated are found in this position. 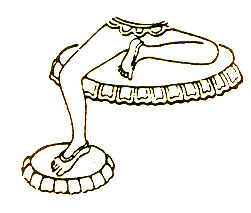 A pose of ease-one leg pendant and often resting on a lotus flower. The other leg is in the usual position of Buddha. Taras, the consort of Dhyani Buddha, Saraswati, Basundhara are found in this Asana. 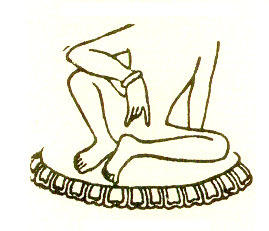 The Europeon position seated knees apart and both legs pendent. 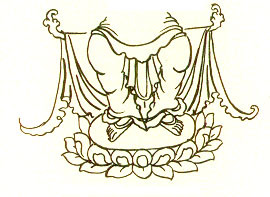 The position of Maitriya Buddha. 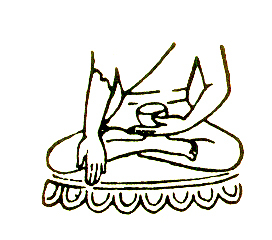 Seated with right knee raised and left leg in the usual position of Buddha. Right arm hanging loosely over the right knee. Hindu deities are often shown in this posture. A pose standing either in straight or in various degrees of flexion of body or legs. Boddisatwas are found in this position. A pose stepping to the left with right leg straight and left leg bent. The aggressive forms of God, the Dakinis and the wrathful deities are found in this position.